A commercial dishwasher that fits your needs? That's advanced. The Hobart LXe Undercounter Dishwasher is designed to pack best-in-class cleaning power into a compact space, all while saving you money in water, energy and training. 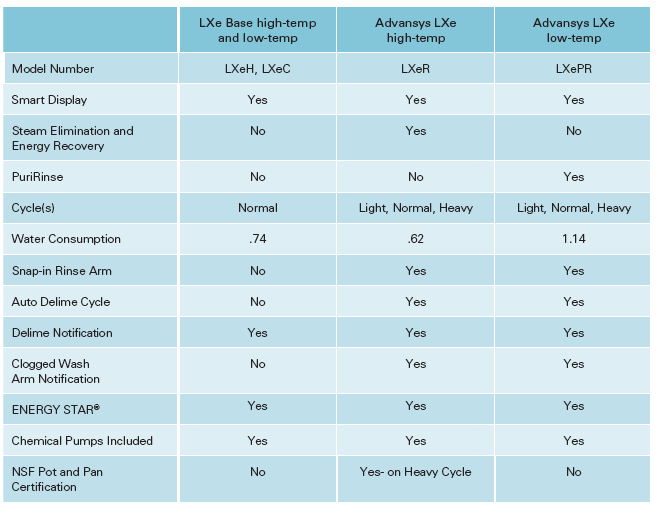 Available in both high-temp and low-temp models, the LXe Base and Advansys LXe undercounter warewasher are perfect for bars, coffee shops, restaurants and care facilities. The Hobart LXe sports advanced new features that support best-in-class wash performance and save costs from energy and water usage. 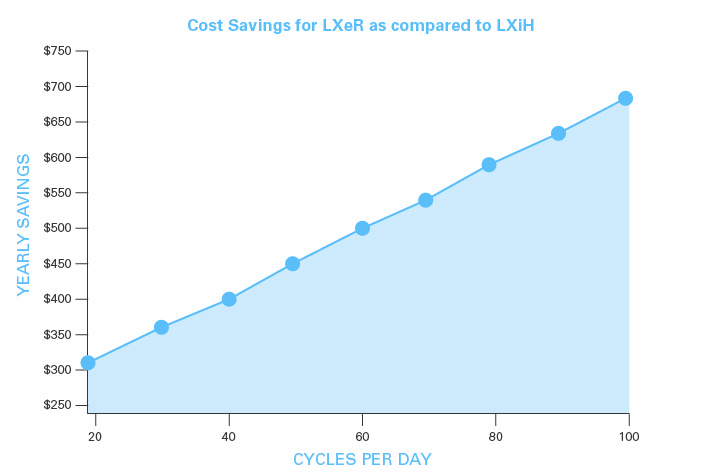 In fact, the Advansys LXe high-temp model can save you up to $485 per year (based on 60 cycles per day). The Advansys LXe high-temp model includes Hobart-exclusive Energy Recovery technology. This advanced feature recycles hot water vapor produced during the wash and rinse cycle and uses it to preheat cold inlet water. Energy Recovery saves you not only energy, but also reduced steam released into the air, improving both the operator and customer experiences. The chemical sanitizer used in typical low-temp dishwashers can remain on your ware, creating off-tastes or odors and unsightly spotting. The Advansys LXe low-temp model features PuriRinse, a cold-water rinse that removes chemical residue, which helps ensure the best beverages for your customers. Both the LXe Base and Advansys LXe feature improved display panels that simplify operation and maintenance. In fact, the Smart Display on the Advansys LXe informs the operator of common maintenance operations, like auto deliming or clogged wash arms, without using complex error codes. The LXe Base and Advansys LXe high-temp models are equipped with Hobart-exclusive Sense-a-Temp booster heater technology, capable of delivering a 70°F rise in rinse-water temperature and ensuring your ware is properly cleaned and sanitized at 180°F. The LXe features redesigned, easily removable wash arms—useful for easily clearing clogs, should it ever be necessary. Additionally, the Advansys LXe features snap-in rinse arms that are even easier to remove and install.